This feature is available for Enterprise and Elite users only. For more information about pricing plans, or to upgrade, visit app.box.com/pricing/. 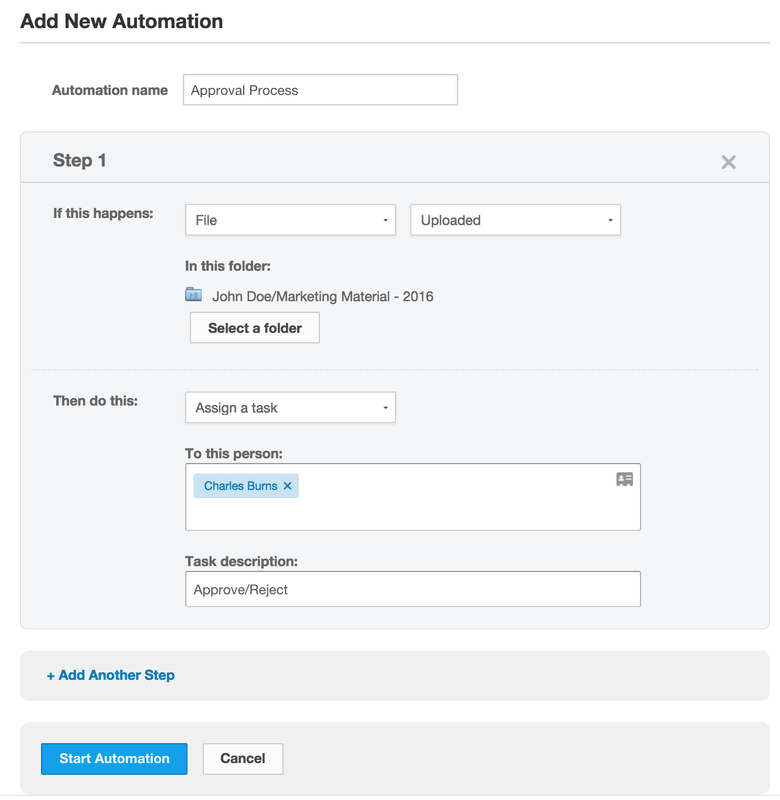 Contact your Box Customer Success Manager or Box User Services to turn on this feature. In the Admin Console, in the lefthand navigation, click Content. When the Content Manager displays, click the Automation tab. File Uploaded: Triggers an event when a file is uploaded. File Moved: Triggers an event when a file is moved. File Copied when a file is copied. Enter the automated event using the Then do this section to assign a task. Assign a task: to the individual(s) you specify in the To this person field. Move File: to the folder you specify in the To field. Add steps as needed by clicking Add Another Step and repeating steps 4 and 5 in the new step section. A notification will appear in the folder where Automations are enabled, detailing the event that triggers the Automation as well as the subsequent event. Click Show details in the right-hand corner of the notification to view the Automation events or Hide details to collapse the notification. Notifications will not appear in the destination folder for files that have been moved as a result of an Automation (only in the folder where the Automation originated). If a file is moved to Folder A (or Folder B), this will result in a cyclic move. Box prevents de-duplication (repeating the same tasks within a given time period). If you get into this situation, the process stops after the last action that was not already performed. In this case, the move to Folder B is the last action (as moving it back to Folder A is an action that was already performed). If you are collaborating in the folder where an Automation originates, you'll see the notification that an automated process is applied to files in the folder. If you are not collaborating in the destination folder in a given Automation,youwon't see the destination folder's name in the details -- that is, it will be hidden. If you are accessing the folder where an Automation originates anonymously via a shared link (that is, you're not logged in to Box or not part of the organization), you won't see any Automation notification at all. If you don't have permission to view the collaborators in a folder (that is, collaborators are hidden or you a member of the organization but not collaborating in the folder), you'll see the notification but not the person to whom tasks are assigned. If you're not collaborating in the folder where an Automation originates, but are collaborating in the destination folder, you'll see the destination folder name in the Automation notification (if the notification is exposed to you). Visibility permissions correspond to the collaborator permissions and cascade from parent folder to any corresponding child folders.